MPs are crusading for citizens of all 52 commonwealth countries to have “fast-track” visa to the UK since Brexit. 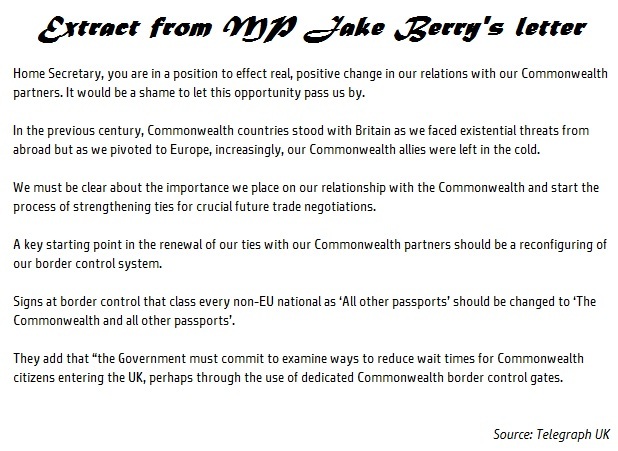 A letter organised by Jake Berry – MP for Rossendale and Darwen – has been sent to the Home Secretary – Amber Rudd to “extend the hand of friendship to our Commonwealth partners” as revealed in the Telegraph. Extending “hand” also include fast-tracking visitors from these countries with a special sign welcoming them. The letter was signed by 45 MPs with the matter to be discussed in detail on 26th Feb.